Rose gold is the color of choice for many women, and men who think their girlfriends will like its rosy pink hue can choose from a number of rose gold engagement rings. Whether for the girly girl, the lover of all things pink, or the true romanticist, rose gold is a symbol of love, and is feminine enough that most women will love it. Unfortunately, there are thousands of choices out there and choosing just one can be more than a little difficult. 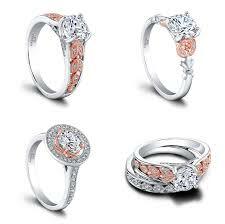 The following includes the top ten rose gold engagement rings for 2013 and 2014. The center cut diamond ring is the most classic engagement ring out there, and if you choose a rose gold one, it’s a bit more unique as well. The ring in the picture is from Zales and features a 1/3rd karat diamond set in the center with scroll detail and a ½ karat of complementing diamonds on either side of the main gem. At $1,529 it’s an investment, but it’s also something she’s sure to wear for the rest of her life. 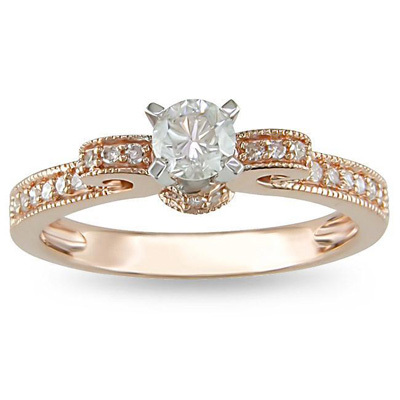 Also from Zales is this budget rose gold engagement ring in startling pink. The ring combines the luxury of rose gold with an adorable lab-created pink sapphire and 1/10th of a karat of real diamonds, sure to make any feminine lady fall in love (with you of course not the ring). This ring is definitely only for the girly-girl as it’s much too pink and feminine for a more rough and tumble gal. The ring itself feature a large center pink stone, two lines of complementing diamonds, and a thin, plain band of rose gold. Plus, at just $279, it’s a steal that’s sure to make her heart melt, even after she learns the price. If your girl doesn’t like flowers, consider skipping this one, but whether she’s into mysticism, ancient egypt, a garden, or even flowers, she’s almost certain to love this lotus cut ring. 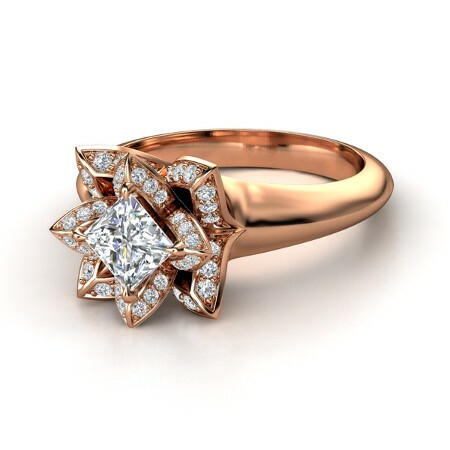 The ring features a stunning design of 14k rose gold, a large diamond cut center stone and 48 mini diamonds set into a fabulous lotus pattern. The ring is breathtaking, and sure to take your breath away when it comes to take out your credit card, but at $3,500 it’s still a unique piece of art that she won’t ever put in the dresser drawer. For the budget minded couple looking for a unique and beautiful rose gold engagement ring, this $435 masterpiece pretty much takes the cake. 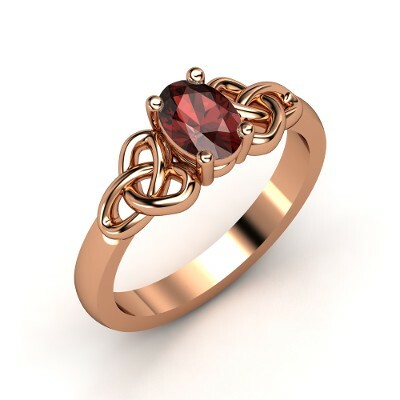 The ring features a unique blend of 14k rose gold with a center cut red garnet and scrolling heart shaped artwork woven into the gold on either side of the ring. 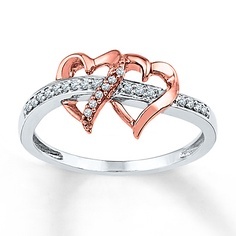 For the lady who loves fabulous, one of a kind items, this ring is quite simply perfection. 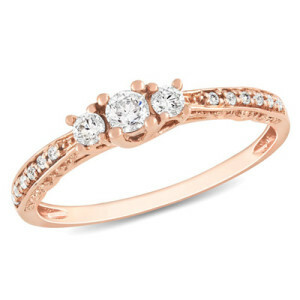 Every woman has a bit of a glamor girl somewhere inside, but for the woman who lets it out, this rose gold engagement ring is definitely the way to go. Featuring a double spiral of diamonds totalling .88 karats in weight cradling a center 1 karat round diamond, this 14k gold ring is definitely an attention getter. The ring is very pink, has lots of diamonds, and is so expensive that we dare not mention the price. You can also swap out the side of the diamond for an up to 3 karat stone depending on your budget. A simple ring for a simple lady, this ring is mid-priced and just about perfect for anyone not looking for a statement piece. 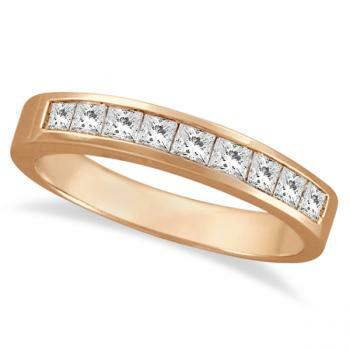 The ring feature a simple band of 14k rose gold with nine inset princess cut diamonds totalling a half karat. While not glamorous, it’s very wearable, even for someone who doesn’t necessarily dress up every day. Best of all, it’s just $910 which is pretty do-able for most budgets. If you don’t like the idea of buying your engagement ring on Amazon then skip this one, but otherwise it’s a beautiful ring at a price you can’t beat. 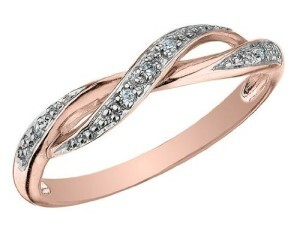 The ring features two interwoven spirals of rose gold with diamond encrustation, making it a simple but lovely ring. It won’t cost a fortune at $300-$150, but she’s sure to love it, and she can most likely wear it with her wedding ring. 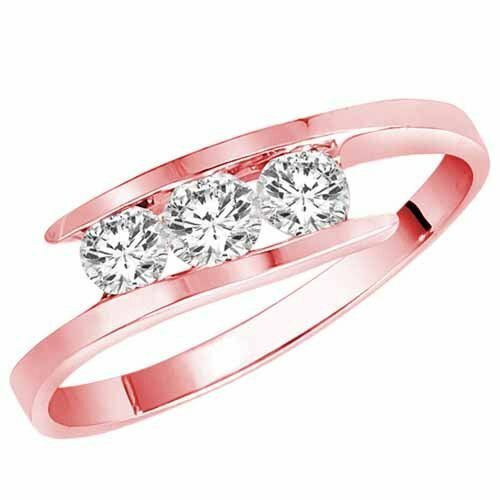 Another Amazon gem, this ring has simplicity, glamor, and style all rolled into one. The ring is deceptively slender but the 14k gold band wraps around to cradle a line of 3 channel set round diamonds totalling a ½ carat. The ring is just fabulous enough to make any lady happy, but simple enough to make it easy to wear, which means that it’s absolutely fabulous. 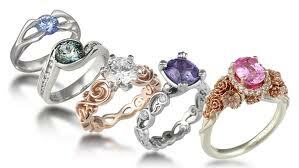 The ring is also made in the USA, and has a number of happy customers on the page. If you like the idea of a non-traditional engagement ring then this heart shaped rose gold ring from Jared is just the thing. Priced at a jaw dropping $179 with a mix of 10k white and rose gold, and 1/10th of a karat of tiny diamonds, this ring is a sure winner. 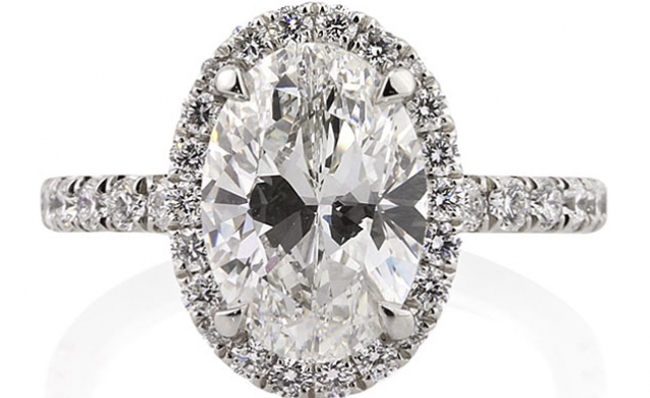 It doesn’t scream classic engagement, but it says love like almost no other ring will. Plus, Jared offers low monthly payment options of $25 a month, so even if $179 is out of your budget, you can still spring for the ring. This ring is not the best one on the list, but it’s not the worst either, it was just too difficult to pick a single ‘best’ out of the many rose gold engagement rings. 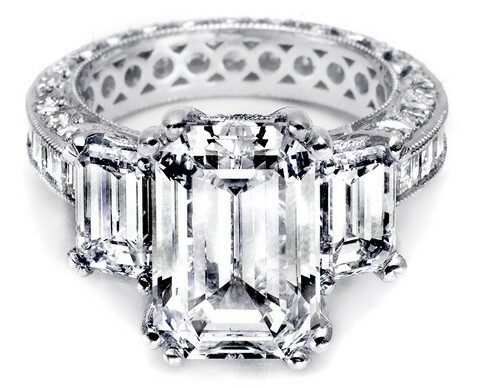 If the center stone engagement ring is the classic choice, the three stone is it’s big sister. 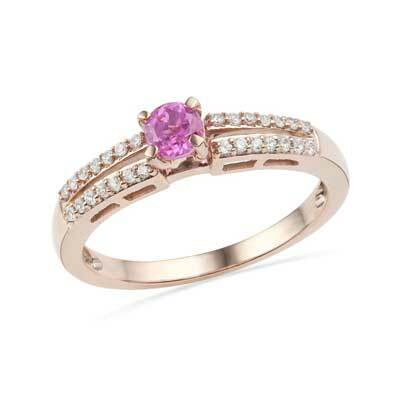 This ring is from Zales and is priced at just $529, a remarkable price for what you get. 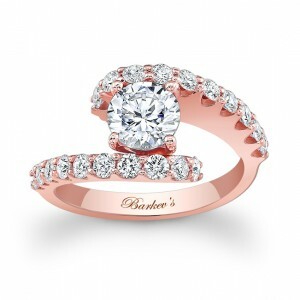 With three center diamonds totaling ¼ ct. in weight, and a 10k rose gold band with inset diamonds, the ring is a sure winner for about 90% of women.